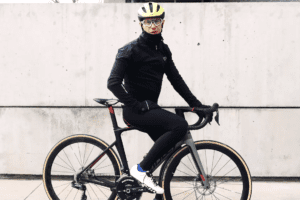 Riding in the cold of autumn can be a real challenge. For some, it’s the best time of year to ride, while for others it’s the worst. In the past, I’ve been of the latter view. In 2016, I could hardly bring myself to ride through October. This year, however, I decided to try and prevent a similar reaction to colder, wetter weather by changing my approach to riding. I have a few tips and suggestions for getting through the cooler season that have work with my training for the past two months. No one needs to be fast at this time of year. As nice as it is to average more than 30 km/h for your ride, being dry and warm is much more important. If you have a winter bike, use it. It doesn’t matter if it’s slow. It makes the training harder anyway, which is a bonus, right? Put quality, wrap-around fenders (with extensions) on. They’re heavy and act as sails, but they keep all that unwanted water from the road off of you (and your friends). I took way too long to realize the positive effect of fenders, and spent far too many training rides miserable and wet because I thought I needed to ride fast. As a frugal individual, I refused to spend money on warm clothes. I trained with what I got for free from my team, and that’s it. I always wanted more, but couldn’t bring myself to buy it. I finally bought some thermal, waterproof tights this autumn, and I already know they’ll be my favourite article of clothing. Shoe covers, wool socks, neoprene gloves, wool base layers and jerseys, a buff and a rain jacket are the other essentials. If it’s pouring rain and you have a four-hour ride to do, ride on trails where it’s warmer. Or try new roads to keep it interesting. If nothing about the ride is enjoyable, you’ll likely focus on how unhappy and cold you are. It can be really difficult to get moving on a cold, dark, wet morning. If you aren’t meeting anyone, you might put off your departure and sit at home dreading the ride. Knowing that people are waiting for you will help you get out the door. The company the provide will keep the ride more enjoyable. It might sound silly, and it might not be for everyone, but listening and dancing around to loud, upbeat music while getting dressed for a ride has been key for me this season. It feeds me with positive energy, and also warms me up a bit as I dance around. Throw a coffee into the mix for increased enthusiasm. Do you have 5 tips for being as “cool” as you oli? stay frosty out there my dude. I wish I knew how to properly oli. If it’s pouring rain, please stay off the trails, unless they’re built for it.